The Rila Monastery, founded by John of Rila in the X century is the oldest, the biggest and the most impressive monastery not only in Bulgaria, as it was registered in 1983 in the UNESCO book as a Cultural World Heritage site. It is situated at 119 km from Sofia and is the best example of the Bulgarian architectural perfection. The precious environment that surrounds and harbours the monastery stands out, as well as the big cultural and artistic richness expressed through the frescos, wood carvings, iconostases, liturgical objects, silver works, arms and relics that have contributed through the centuries for the preservation of the culture and the national spirit. In the monastery is located the famous Raphael cross. This wooden cross is unique for the 140 microscopic scenes from the Bible featuring more than 1500 figurines, the largest of them no bigger than a grain of rice. A monk called Raphael carved it with a pin on a piece of linden wood, for 12 years until he became blind. This is the second most important monastery in Bulgaria. Situated in the Rodopes Mountain, at 30 km to the south from Plovdiv, the monastery was founded in 1803 by the two Gregorian brothers Bakuriani. The Sokol monastery “Assumption of the Blessed Virgin” is a nun monastery and is still active. It is located in the Balkans and along the river Yantra, at 12 km to the southeast from Gabrovo. The monastery was an important educational centre, and also played an important role during the fights for national liberation. 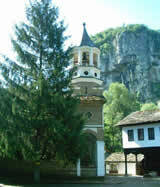 The Troyan monastery is the third Bulgarian monastery in its size and importance. It was built in the XVII century and was plundered and burned several times. Since it was founded, the monastery started growing and amplifying. In the middle of the next century, was created a school attached to the monastery, which gained fame very soon and became the educational centre of the region. The Dryanovo monastery is located at 4 km to the southwest from the town of Dryanovo, in a colourful defile of the river with the same name. Today the monastery is still active and is for men. 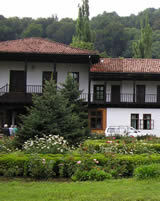 It was established in the XII century close to the summer residence of the Bulgarian kings from the Asen dynasty. In that period it had one of the biggest libraries and was an important literary centre.